Social media has become an integral part of everyday life. Everyone from junior high students to world leaders have social media accounts, and companies large and small have discovered the immense value and potential of reaching audiences on these mediums. According to recent studies, the average American spends around 37 minutes per day on social media, with close to half of them using social media as one of the factors in their purchasing decisions. While most companies are now familiar with the major platforms like Facebook and Twitter – which have 99% and 97% respective adoption by major brands – there is still a great deal of potential in the smaller but vital (and growing) social media platforms, particularly Instagram. Want to take a free trial of Unmetric? Click the button below to get started. Instagram was actually purchased by Facebook for $1 billion in 2012, but the social media titan has allowed Instagram to grow and flourish fairly independently. As a result, Instagram is widely regarded as the most popular social media platform for younger Americans, and its simple and elegant interface is ripe for effective marketing campaigns. Instagram’s unique marketing potential is driven largely by its simplicity. Each user’s feed is filled with images and very little text, which makes the experience fun and exciting. At the same time, Instagram has robust hashtag and @mention functionality, making the platform surprisingly powerful from a social and marketing perspective. On the other hand, Instagram’s simplicity and uniqueness poses a particular challenge for those who want to use it as a marketing tool. Instagram itself offers no analytics for its users, which makes it difficult to produce accurate Instagram analysis reports from Instagram alone. Marketers are desperately looking for photo, page, post, hashtag and trend analysis tools. Fortunately, there are third-party tools designed to provide substantially more information for companies who want to use Instagram data analytics for marketing purposes. There are a few primary uses for a third-party service on Instagram. The most obvious is using third-party tools to produce detailed analysis of trends, traffic, and general insights about your company and your industry. For example, hashtag analysis can be utilized to see exactly which branded hashtags, topical hashtags, and (most interestingly) which industry-relevant terms are being used successfully as hashtags. Third-party tools can also provide a wealth of information about your competitors, including relative amounts of traffic and followers. Third-party tools such as Unmetric can also be used to find inspiration from other popular and successful brands, regardless of whether they are a part of your industry or a completely different one. Using Unmetric, you can easily keep track of the most engaging hashtags between you and your competition, Through the platform you can click on each graph and see the actual Instagram posts that made up the campaign. When using a third-party service like Unmetric, Instagram marketing campaigns will be able to much more accurately determine which images are the most successful in generating new followers and overall buzz. Easily understand what type of content is working for you. 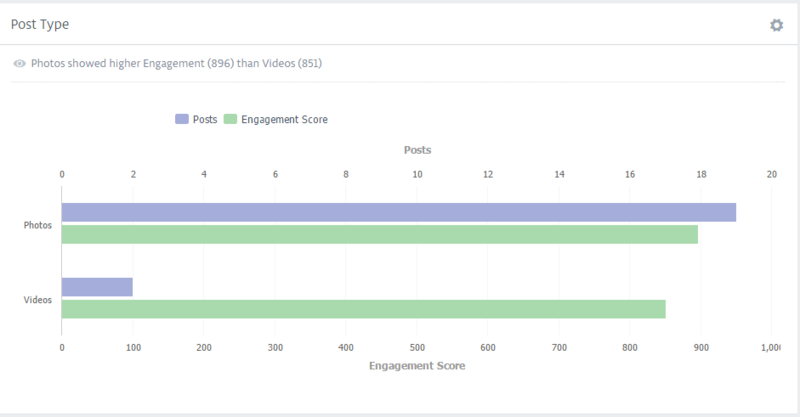 Through the Instagram chart analysis posted above that photos receive higher engagement. They can also be used to test out experimental marketing initiatives on Instagram to determine which ones are most effective. The analysis of these experiments can be incredibly granular, including metrics as specific as most used photo filter, most engaging photo filter, and growth rates over as large or narrow a period of time as necessary. Finally, using a comprehensive solution like Unmetric for Instagram analytics will allow a company to more effectively integrate their digital marketing efforts across multiple social media platforms (eg. Facebook). Unmetric also acts as a competitive monitoring tool, and has access to the performance of several thousands across 30 industries on Instagram. Which industries can benefit most from Instagram analytics? Fashion brands, which can display their products in social or popular venues, as well as campaigns that involve their customers. One example is Warby Parker’s #WarbyHomeTryOn campaign. Luxury brands, which can use extensive editing techniques to make their product images attention-grabbing. A great example is Louis Vuitton’s decision to announce new product lines on Instagram. Luxury brands can really take advantage of the Instagram photo analysis third parties provide. Food and beverage brands, which can show their products in a favorable setting or at popular events (essentially combining the fashion and luxury strategies). One example of a company that is successfully using Instagram is Chobani and their “Chobani Love” campaign. Automotive companies, which can combine events, high-production value images, and competitions to engage social media users. The Mercedes #GLApacked campaign is a great example of this. For those looking for inspiration, the Mercedes GLA Campaign on Instagram is a great example of exactly the type of creative campaign that can be highly effective on the Instagram platform. Using the hashtag #GLApacked, Mercedes offered prominent Instagram users the opportunity to participate in an cross-country trip using a Mercedes GLA that was lent to them. The campaign generated a massive amount of buzz and is still talked about in the digital marketing community.